서명/저자 Trade unions and migrant workers : new contexts and challenges in Europe / ed. by Stefania Marino, Judith Roosblad, Rinus Penninx. 발행사항 Cheltenham : Edward Elgar Publishing , 2017. 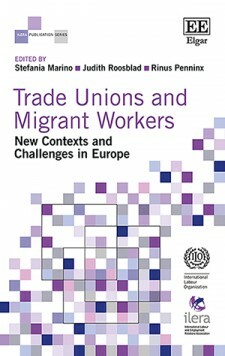 This timely book analyses the relationship between trade unions, immigration and migrant workers across eleven European countries in the period between the 1990s and 2015. It constitutes an extensive update of a previous comparative analysis – published by Rinus Penninx and Judith Roosblad in 2000 – that has become an important reference in the field. The book offers an overview of how trade unions manage issues of inclusion and solidarity in the current economic and political context, characterized by increasing challenges for labour organizations and rising hostility towards migrants. The qualitative analysis of trade union strategies towards immigration and migrant workers is based on a common analytical framework centred on the idea of ‘dilemmas’ that trade unions have to face when dealing with immigration and migrant workers. This approach facilitates comparative analysis and distinguishes patterns of union policies and actions across three groups of countries, identifying some explanations for observed similarities and differences. In addition, the book also includes theoretical chapters by expert scholars from a range of disciplinary fields including industrial relations, migration studies and political economy. This comprehensive comparative analysis is an essential resource for academics across a range of disciplines as well as policy-makers, practitioners and organizations involved in trade unions and migrant inclusion and integration. 1. Introduction: How to study trade union action towards immigration and migrant workers? 10. Sweden: A model in dissolution?